Buddhist sculpture slab from Mir Jan, Peshawar District: Buddha taking leave from his wife. bl.uk > Online Gallery Home	> Online exhibitions	> Asia, Pacific and Africa Collections	> Buddhist sculpture slab from Mir Jan, Peshawar District: Buddha taking leave from his wife. 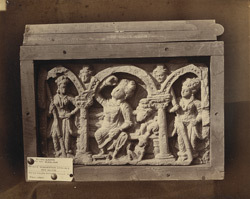 Photograph of a Buddhist sculpture slab from Mir Jan in Peshawar District showing the Buddha taking leave from his wife.This photograph was taken as part of the Archaeological Survey of India, although the attribution of the photograph to Cole is probably incorrect. It depicts a small sculpture slab, boxed for transportation, with a label identifying the find-spot as 'Mian Khan Tope at Merjan', and stating 'Recd. from Major Cole R.E. Dec. 1883.' The sculpture is 'said to be in Bombay' (Bloch).